Serco Yamaha’s Luke Clout is the new MX2 champion in the Monster Energy MX Nationals, as privateer KTM rookie Caleb Ward put forward a dominant performance at Coolum’s season finale. Ward once again starred in moto one, racing away from the field to win by over 10 seconds from Luke Arbon (SD3 Husqvarna) and Clout, who did what he had to do in the championship chase. Josh Cachia (Penrite Honda) and Hamish Dobbyn (CMR Red Bull KTM) completed the top five, while Takeshi Katsuya (Kawasaki) was a solid sixth in just his second appearance of the season. Moto two was again the same in terms of the top three, with Ward topping Arbon and Clout, while Katsuya climbed to fourth this time around in front of Dobbyn. Cachia was absent after an off-track incident (officially labeled a ‘scuffle’ by officials) involving Dylan Peterson prior to the opening moto, which resulted in both fined $1000 by Motorcycling Australia. Soon after Cachia departed the venue and didn’t race again for the round despite his moto one result. 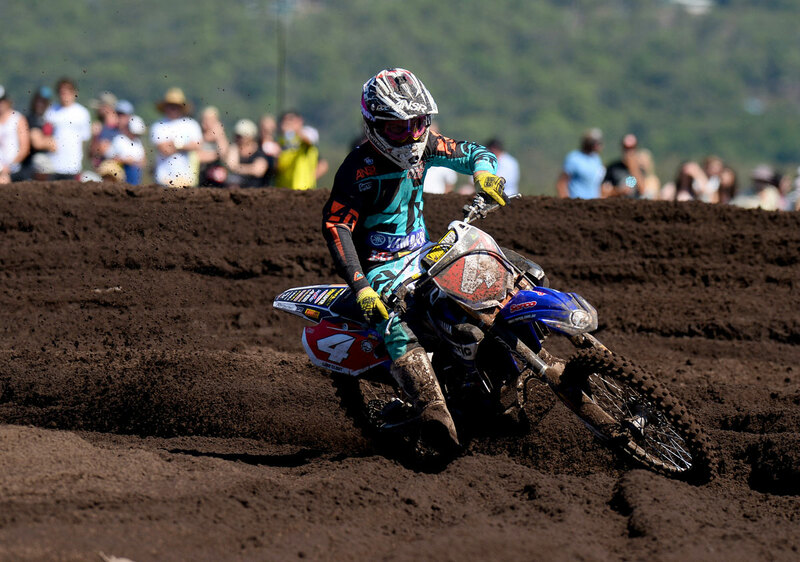 A third moto win handed Ward his third overall victory of his stellar rookie season, but it was Clout’s conservative ninth that clinched his first professional title and Serco Yamaha’s second in a row. Behind Ward in moto three was Katsuya and Jay Wilson, with Riley Graham (KTM) rising to fourth ahead of Hamish Harwood (CMR Red Bull KTM), whose fifth have him second in the series after Arbon DNF’d with a crash early on. For the round it was Ward who won ahead of Katsuya and Clout, while in the series Clout reigned supreme from Harwood and Arbon.